Make sure any dogs are kept under control - don't let them worry sheep. These are just some suggestions for walks. We won't tell you which path to take, you need to do some discovering yourself! 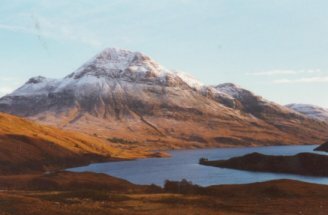 It is also worth noting that the Highland Council Ranger Service provides guided walks around the Assynt area which are well worth looking out. Contact them on Tel/Fax 01571 844654 or call in at the Assynt Visitor Centre in Lochinver. This is, of course, where the holiday accommodation is based and so may be the first place you want to explore. Reiff has magnificent views to the south and west, and on a clear day you can see the mountains of Harris, with Clisham dominant, across the Minch, while further south the Shiants and the northern peninsula of Skye are bunched on the horizon.At the very end of the road a bridge and a gate lead you on to "the Island" not strictly such, but the area between the shallow Loch of Reiff and the sea. This is a good area to explore with magnificent sea scapes - really spectacular when the sea is breaking on the cliffs. The cliffs are well known in rock climbing circles. Following round the coast you will come across the bay of Camas Eilean Ghlais with its craggy island - a sea bird paradise. You can continue around here for as long as the energy lasts, you may even want to continue round the headline and make your way back to the road at Achnahaird. You will see magnificent mountain views over to the Lochinver area from this stretch. There are many walks around this area, and a couple of starting points are suggested. One option is to leave your car at the car park near the Youth Hostel. This is beside the Ach a Braighe burn (pr. Achavrie) and you can either walk up the burn and into the hills or down the burn, past the Youth Hostel to the sea. A second option is to take your car to Culnacraig and again you can walk up into the hills or make your way down to the sea again. 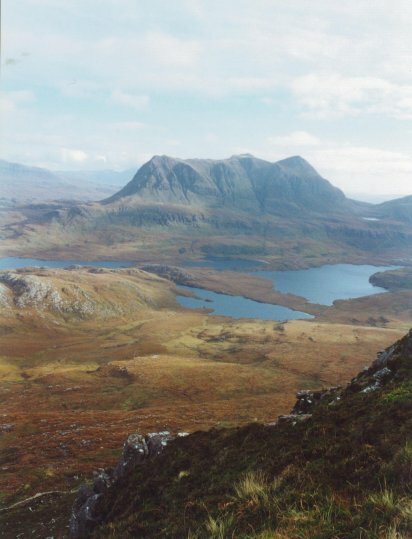 There are magnificent views of the mountains to the south across the loch while behind you rises Ben Mor Coigach (2419ft) and Cona Mheall (1786 feet - "The Hill of Enchantment"). Straight ahead lie Isle Martin and the entrance to Camas Mor and the anchorage of Ardmair Bay. This track along "the Rock" is a fairly adventurous scramble, and one only for the steady-headed, but well worth tackling, at least in its early stages. If you do explore it, remember that in the nineteenth century the Achiltibuie postman used this route to reach the village! This walk leaves from Old Dornie, the local harbour. Start the walk along the coast from the outer jetty. Across the water is Isle Ristol, and ahead of you cluster the Summer Isles at the mouth of Loch Broom, while on your left are the western crags of Meall Dearg, the Red Hill. You will notice that the ground is corrugated in this patch and this is the site of "lazy beds", where, in years gone by, crops were cultivated with a mulch of seaweed on the ridges. You will see the lines of such beds across the water on Isle Ristol and elsewhere in Coigach. Continue around the shore past the little bay with a boulder beach. 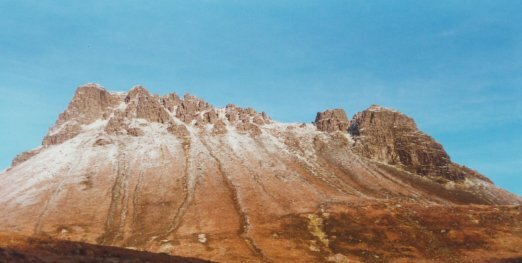 The views of the mountains to the south open up and will dominate the remainder of the outward part of the walk.From here the route is fairly level and Fox Point (Rubh' a' Mhada ldh-Rualdh) with its ruined salmon fishing bothy can be seen clearly with the mountains, An Teallach ahead and the Torridons in the distance to the south. This walk kicks off from beside the house surrounded by trees, just before you come into the village of Polbain. The tarred road up to the house changes to a track which you can follow.This is the old Peat Road leading to the workings in the hollow below Meall an Fheadain ("the Hill of the Fairies") and Meall na Beiste ("Fox Hill"). 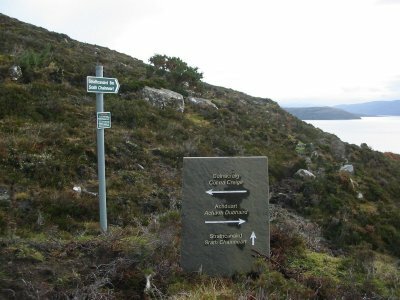 From the end of the peat road (approx 1.5 miles), you have a number of options, retrace your steps or walk into the hills or down to the lochs. Into the hills will take you towards the back of Polbain. You will see a mast on one of the hills, aim for the high point just beside this. This is Meall an Fheadain (667 feet), which has a trig point and cairn. 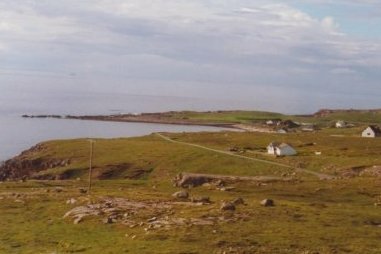 As the highest point on the relatively low-lying peninsula the views all round are magnificent, not least of the Outer Hebrides stretching along the western horizon. If you hunt around here, you may find the shelter of rocks from where there was a lookout point in WWII, some of the old batteries from the radios are still lying in amongst the rocks. Start off from the junction at Loch Raa, on the road from Achiltibuie to Achnahaird at the junction to head off to Ullapool. 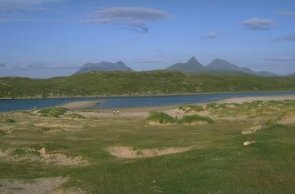 The walk follows the shore all the way round the peninsula which divides Achnahaird Bay from Garvie Bay, both small indentations in the wide expanse of Enard Bay which stretches from Coigach to Lochinver and to Stoer. Soon the little cove of Camas a' Bhuailte opens up with the hill, Cnoc Mor an Rubha Bhig rising behind and beyond. There are ideal picnic spots here, and a wealth of sea-bird life to watch. There is a beautiful little natural harbour with a ruined salmon fishing bothy - again a perfect picnic spot. In another half mile or so you reach a white sand beach and the mouth of the Garvie river.You can follow the river up to where it reached the road at Loch Osgaig and then make your way back to your car. This is a tough mountain ramble and should not be attempted in bad or uncertain weather. Moreover the later sections are high, exposed and for the most part trackless. Start off from Culnacraig. The views from the top to either side are magnificent, and, looking ahead, it seems as though the ridge plunges straight to the sea.